I had an interesting experience recently. I purchased a Hamilton watch and had a really hard time identifying it. I thought I might have found an uncatalogued model or some other oddity. But after a little extra effort I was able to place it. You see, automatics generally come in certain families. There are the Automatics, Accumatics and Thin-o-Matics. But what I didn't realize is there are also Rotomatics. My new acquisition is a Rotomatic II. 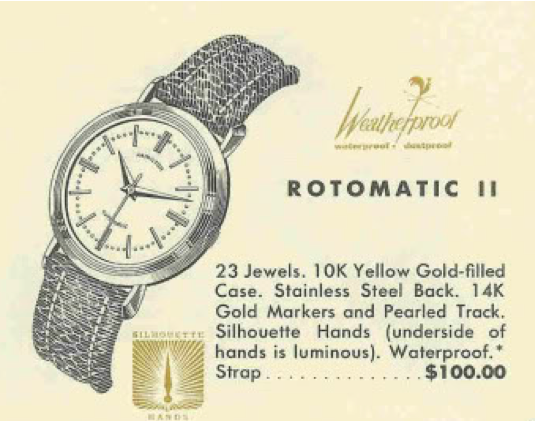 The Rotomatic line was introduced in 1957 and produced through 1959. The Rotomatic II came in a 10K yellow gold filled case with a stainless steel back. 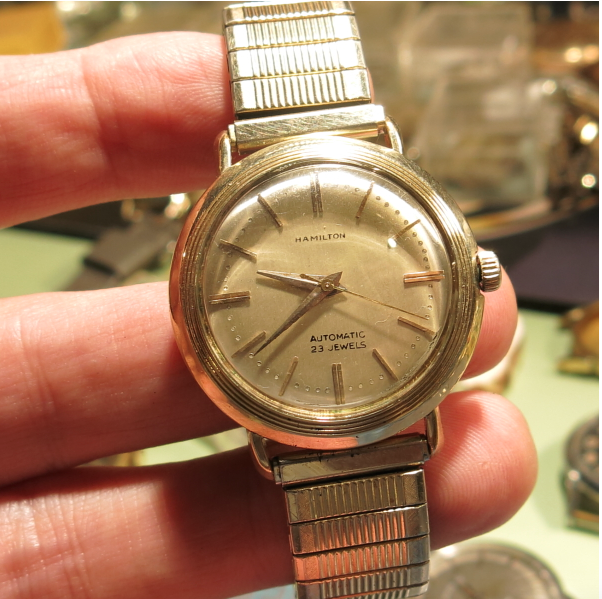 The silver dial has solid 14K gold markers and a pearled track. The yellow gilt dauphine style hands had radium lume on the back so they glowed onto the dial and backlit the hands as a silhouette. 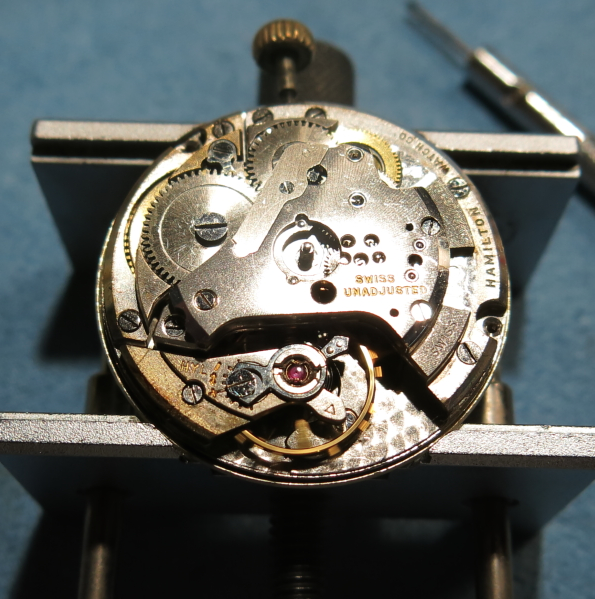 Inside is a 23 jewel Swiss made 665 movement. You don't see this movement very often - or at least I don't see it very often. In fact, this was my first time seeing one so I took some extra photos to show you how it comes apart. As received, my Rotomatic II was in okay shape. 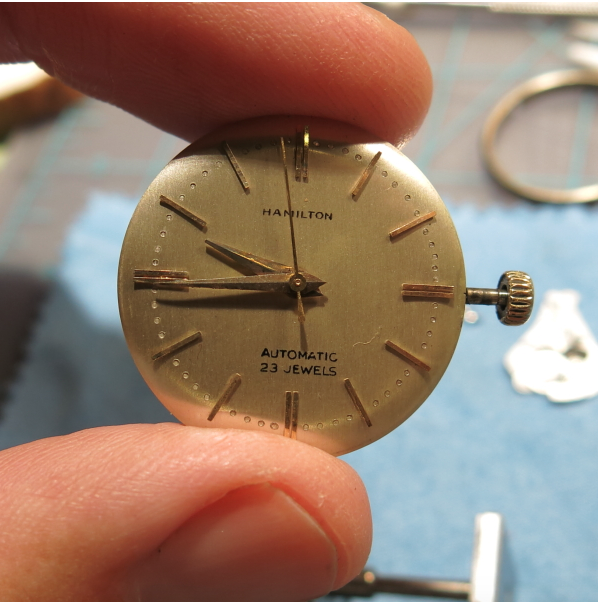 The dial is an obvious refinish since the printing is the wrong font and Hamilton rarely put the number of jewels on the dial (although there are some exceptions). The aftermarket bracelet had to go. This style bracelet with spring loaded end pieces can actually wear grooves into the lugs. It only came on a strap anyway - so I'll make that change later. 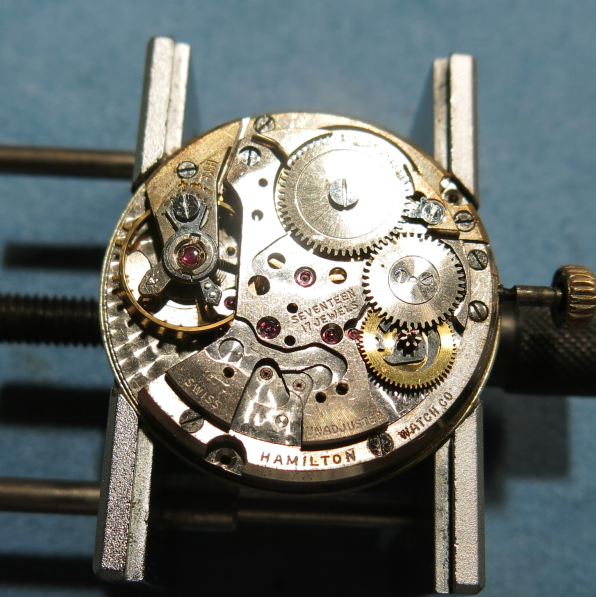 The back of the case is clearly marked Hamilton - so I knew this was an authentic model. These waterproof cases have a gasket inside and sometimes opening the screw-off back can be a real challenge when the gasket gets hard. Here's a shot of the movement inside. It looks very similar to other 17 jewel automatics like the 661. 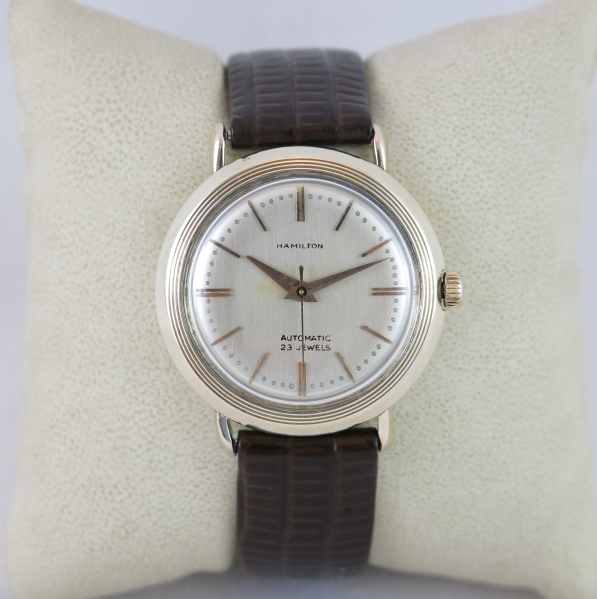 I think the 665 is just a more jeweled version of the 661 and based on the same Certina Kirth Freres calibre 28.45. 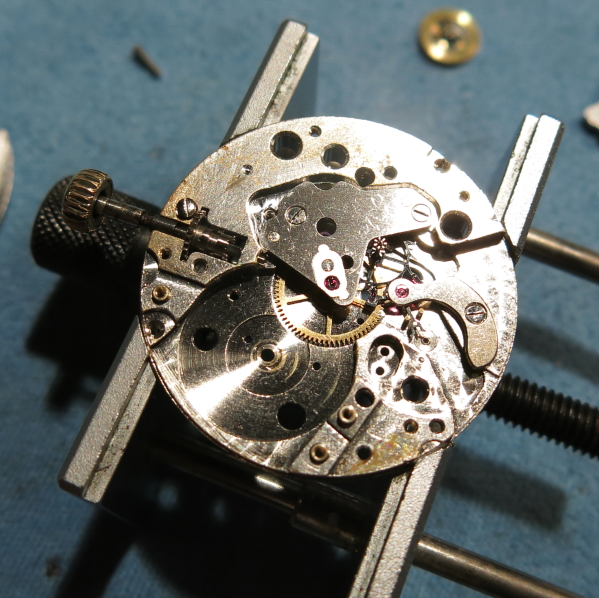 The stem is pulled out by loosening the set lever screw, just like on most other movements. Then the entire movement slips out the back of the case. 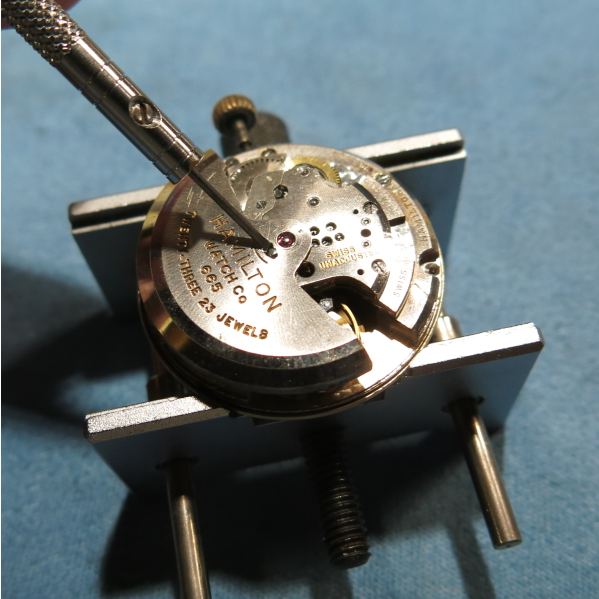 The movement is held inside the case via a movement ring that surrounds the perimeter. You can see the remnants of a gasket in the ring. Here's a nice shot of the dial. You can tell this is a refinished dial because of the fonts used in the lettering. This isn't a surprise since the radium on the back of the hands can burn the dial and I bet that's what had happened in the past. If you look closely you can also see the pearlized dots are empty holes. 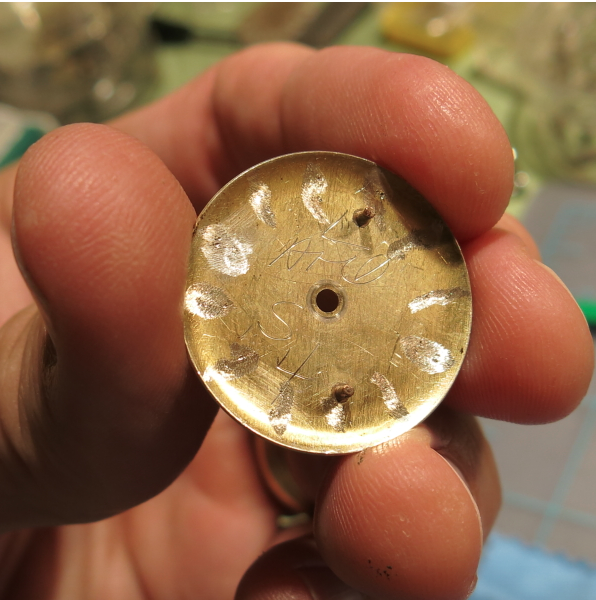 Pearlized dials are tricky to refinish and they often turn out like this. The little holes normally have gold in them to add the pearl-effect and in the past I have taken a tiny paint brush and put paint in each hole. It's a tedious process but the results are usually worth it. 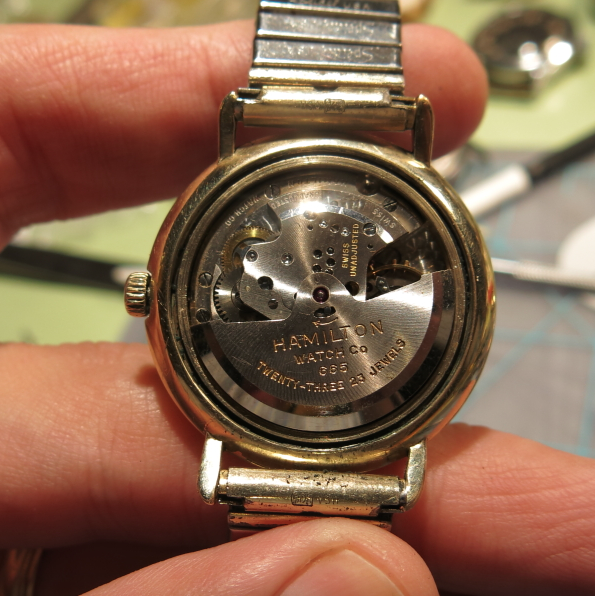 Sure enough, looking at the back of the dial there are a couple of sets of codes scratched in so maybe it's been redone more than once. On the reverse, the first thing to come off is the rotor. These KF-based movements are really easy - you just slide the little toggle switch to the left and the rotor will come off when you rotate it to the right spot. With the rotor removed, you can see the carrier below it. 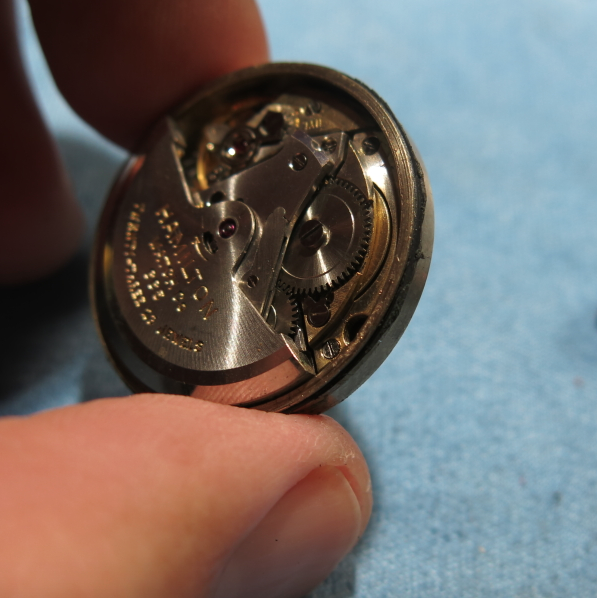 This set of gears transmits the motion of the rotor to the ratchet wheel and winds the watch when the watch is worn. Three screws hold the carrier in place and when they're removed the entire assembly will come off. Now here it's a little interesting... notice the train bridge below the carrier has "seventeen 17 jewels" inscribed. I gather the 665's extra jewels are in the carrier and rotor. 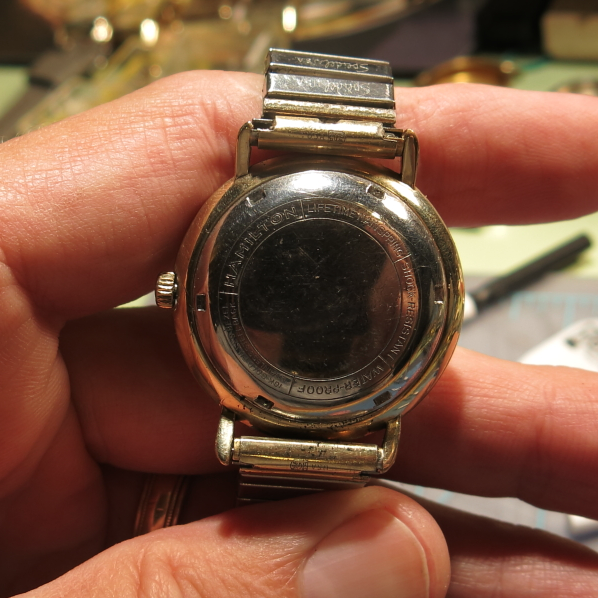 Note also that the train bridge has "Hamilton Watch Co." stamped into it - it's not common to have Hamilton shown twice on the movement (the rotor and the bridge). From here the disassembly is just like any mechanical movement. 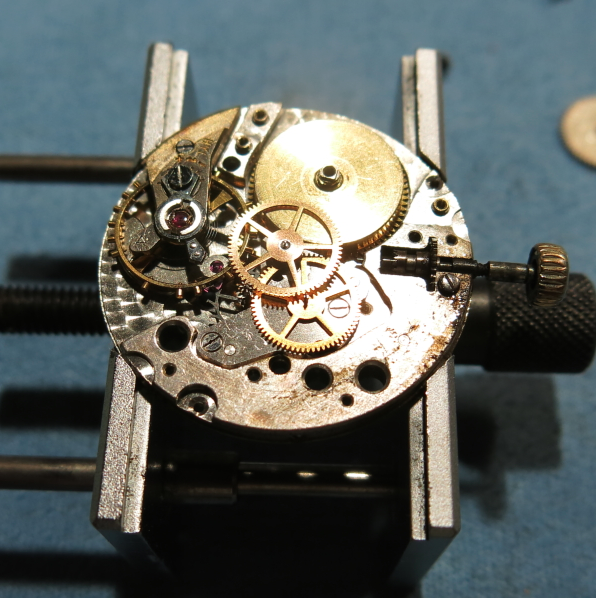 First the mainspring is fully let out, then the barrel bridge and the train bridge can be removed. That leaves the mainspring barrel and the fourth wheel and third wheel visible. You can also see the silver-colored escape wheel tucked next to the balance. The balance can also be removed at this point. With those parts removed you can see there's a small bridge that is supporting the center wheel. Two screws hold it in place and then those parts can be removed as well. All that would be left is the pallet fork (on the right). It has to come out in order to get the center wheel out. Well, at this point everything goes into the cleaner and then two separate rinses. Re-assembly is just the opposite of the disassembly. All of the jewels and pivots, etc. are lubricated and the watch is regulated on the timer. And here is the finished product on a fresh strap and with a new crystal installed. It turned out really well. I'm not crazy about the fonts used on the refinish but it's not bad enough that I'd get it redone. The dial has a slight radium burn from the hour hand being stopped in one place for a long time but the radium is now removed so there will be no further damage. This watch is ready for wrist time. 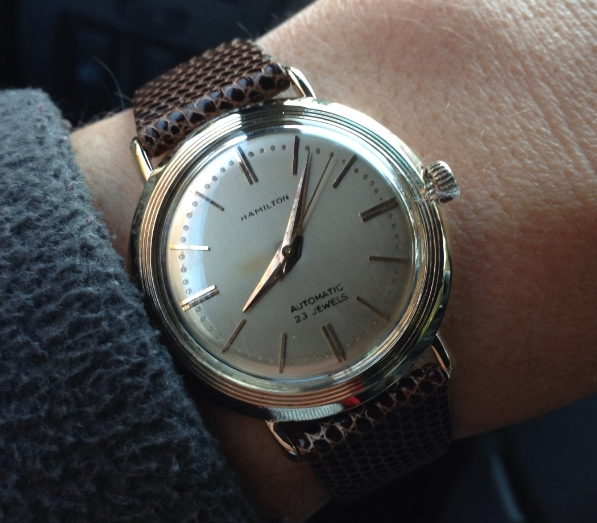 And here's a wrist shot from it's shake down cruise today. You can see in my photo that the crown picked up a piece of lint from my jacket - but other than that the watch had a flawless day.